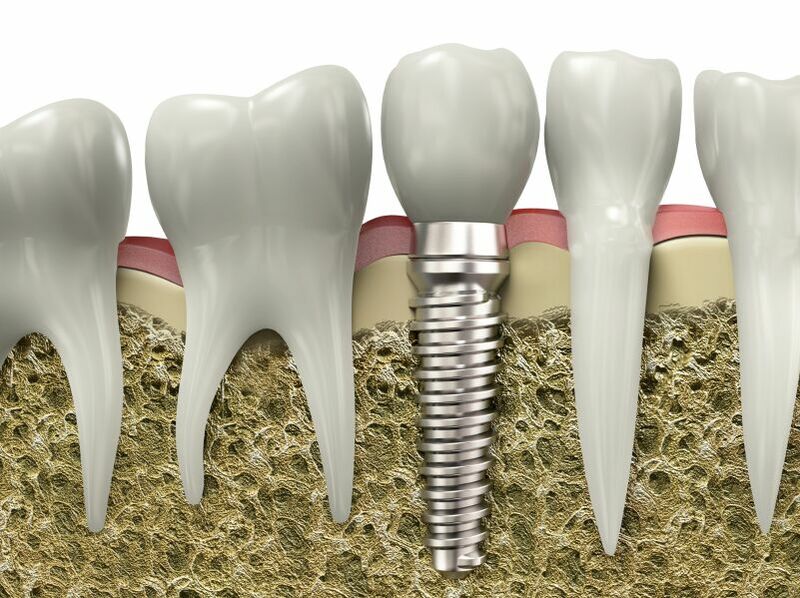 Dental implants are titanium anchors we implant into the jawbone that hold replacement teeth in place. The implant sits in the jawbone beneath the gum line and we attach the visible tooth, or crown. Dental implants look and feel much like natural teeth. They support individual artificial teeth, bridges, and also dentures. At Prosthodontics of New York, we offer dental implant restorations for patients who have a fractured or loose implant that needs to be replaced. “Dr. Sirota is implanting my final teeth, and during my appointment on Jan 4, 2019 he started this process. He explained in detail what he was about to do, and made sure I was comfortable and without pain. It was a successful procedure. Many thanks to everyone.” – Barbara B. Dental implants may be an option for you if you have lost one or more teeth, cannot chew or smile comfortably, or are unhappy with your dentures. To get tooth implants, you must be in overall good health and have strong gums and bones. Patients must follow excellent oral hygiene, which includes brushing, flossing, and regular dental examinations. If you are at a high risk of developing periodontal or gum disease, if you are a smoker, or have diabetes, you may not be a good candidate for dental implants. The best way to know if you are a candidate is to come in for a consultation with either Dr. Sirota and Dr. Roberts. They will be able to assess your oral health and take x-rays to determine if dental implants are the best option for you. First, one or more implants are precisely placed into the jaw bone to mirror the location of the root of the missing natural tooth. After the implants are placed into the jaw bone, there needs to be some healing time so that the implant fuses within the bone. Once the appropriate healing time has taken place, your doctor will take impressions or digital scans of the teeth and bite. These are necessary to custom fabricate a connector post or abutment, and crown. Once the custom abutment and crown are created, they are attached to the dental implant, completing the process. It is very unlikely that your dental implant will ever fracture or break. If this rarity occurs Drs. Roberts and Sirota can help. Our staff will take X-rays to determine if the implant has a fracture or if the problem is with the abutment or the crown anchor. If the abutment is the source of the problem we can use bonding materials for a quick restoration. However, if the problem is with the implant, patients may require a more invasive procedure. This can involve removal of the implant entirely, a bone graft depending on your jawbone condition, and replacement of all the implant parts. If you feel that something is wrong with your implant, schedule an appointment immediately with our staff. Dental implants fit securely and allow patients to chew normally. They are cosmetically similar to natural teeth, so patients can smile without being self-conscious. Implants also can help to slow down bone loss in the jawbone that can accompany tooth loss. Tooth implant surgery is a relatively safe procedure. As with any other surgery, some risks may exist. These risks may include complications from surgery, such as excessive bleeding and a reaction to anesthesia. The surgeon will discuss the risks in greater detail prior to the surgery. Will my new teeth feel natural? Yes, dental implants look and feel much like natural teeth. Tooth implants mimic real teeth and fuse to the jawbone so they feel secure. Implants are often more comfortable and fit better than other replacement options. If you have missing teeth and are interested in dental implant restorations, call 212.758.9690 to schedule a consultation at our New York City office. Prosthodontics of New York serves Manhattan and surrounding areas.